ECO is an abbreviation of Energy Company Obligation, a government energy efficiency scheme. The ECO Scheme started in 2013 with the aim of tackling fuel poverty and reducing carbon emissions. The ECO Scheme helps qualifying householders reduce their heating bills by offering grants to replace broken central heating boilers and storage heaters, as well as installing cavity wall insulation and loft insulation. The government has signed up to internationally agreed carbon emission reductions to help battle climate change and the ECO Scheme is one way of achieving this. Currently, there is only one Energy Company Obligation, the Home Heating Cost Reduction Obligation (HHCRO), better known as the Affordable Warmth Scheme. This provides grants to replace broken central heating boilers and electric storage heaters, and to install cavity wall insulation and loft insulation. Who qualifies for ECO Scheme grants? 1. You must live in your own home. ECO Scheme storage heater grants are not available to private tenants, council tenants, housing association tenants or householders who live in shared ownership homes. 3. In the case of Storage Heater Grants, you must have at least one broken electric storage heater installed in your home at the time of the free ECO Scheme survey. How long will the ECO Scheme run for? The current version of the ECO Scheme is scheduled to run until March 2022. Where does ECO Scheme funding come from? 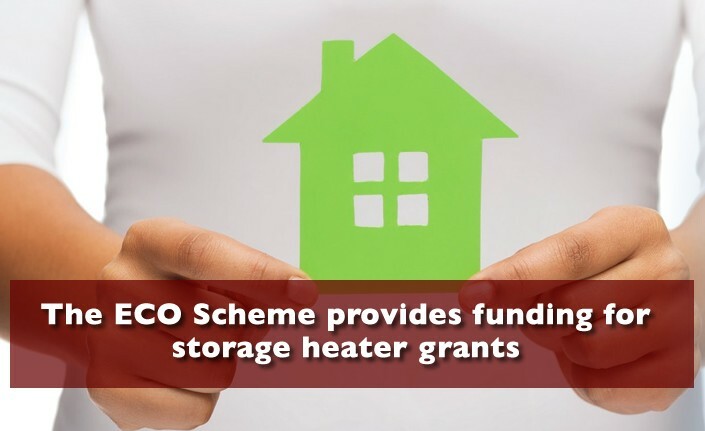 The ECO Scheme placed a legal obligation on large energy companies to provide funding for storage heater grants and boiler grants. These energy companies include British Gas, EDF, E-on, nPower, Scottish & Southern Energy and Scottish Power. Each energy company has a target to reach for the storage heater grants they offer and if they fail to hit these targets, they can be fined. Of course, the money actually comes from their customers in the form of a levy on every householder’s energy bill. The Government has instructed energy companies to reduce this levy in order to keep energy bills down but this in turn reduces ECO funding. As a result, some householders who qualify for a storage heater grant may have to contribute to the cost of upgrading their heating system. Which areas does the ECO Scheme operate in? The ECO Scheme for boiler grants, storage heater grants and insulation grants operates in England, Scotland and Wales. Northern Ireland has its own scheme called Warm Home Grants. Who administers the ECO Scheme? The ECO Scheme is administered by Ofgem on behalf of the Department for Business, Energy & Industrial Strategy (BEIS). BEIS set the overall policy for the ECO Scheme. Ofgem can be contacted at eco@ofgem.gov.uk or on 0207 901 7000. Does the ECO Scheme provide grants for other forms of heating? The ECO Scheme also provides funding to install Cavity Wall Insulation and Loft Insulation. Storage Heater Grants are not currently available to private tenants, council tenants and housing association tenants. Nor are they available to householders living in shared ownership homes. You must receive at least one of these to qualify for a Storage Heater Grant. To qualify for a storage heater grant, the electric storage heaters currently installed in your home must be broken. Any other relevant information if applicable. Copyright & copy; 2017 Storage Heater Grants. All rights reserved.